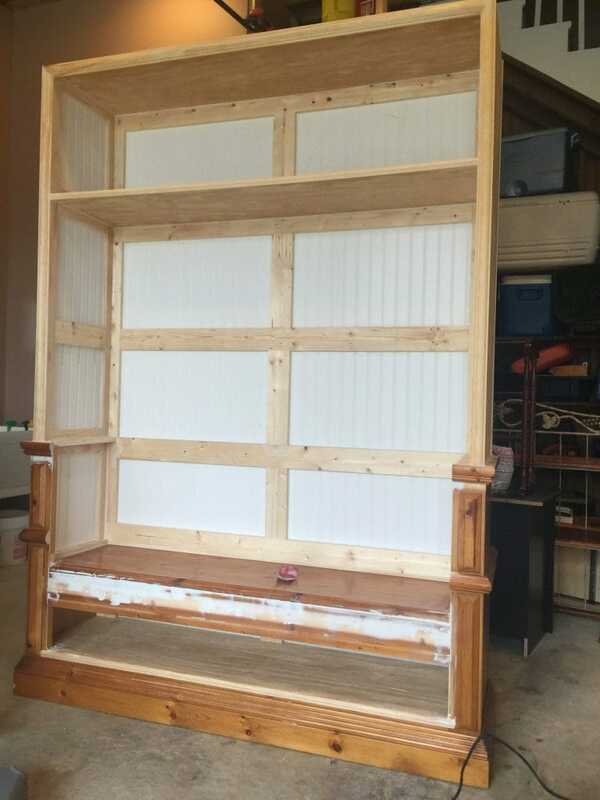 In this tutorial, I show you How to Transform Old Dresser into Hutch. Also, FREE DIY plans are available for download. 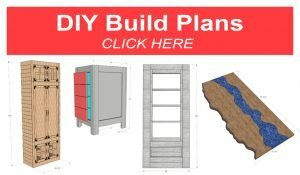 FREE DIY Plans – Complete the form at the bottom of this post. 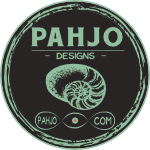 You can visit My Tools page for a complete list of all the tools I use or my online store for DIY plans and handmade items. Like most of my other projects which involves repurposed furniture, I didn’t have any set plans, drawings, or measurements. 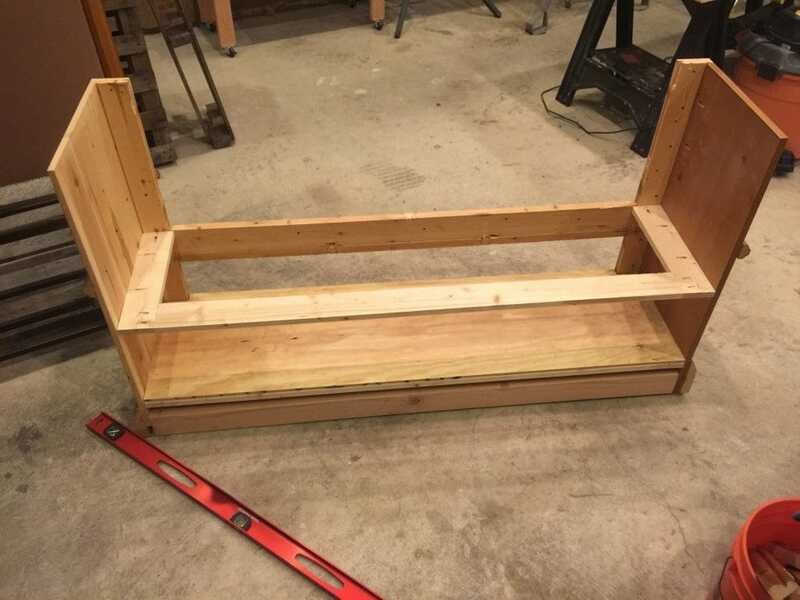 Ultimately, the lack of plans and uniformity is the main reason I enjoy repurposed projects. Moreover, my imagination and creativity lead me to the end result; therefore, it is sort of a work of art rather than a project. The first step to any project is to get a clear picture of the end result. Well, this is easier said than done. 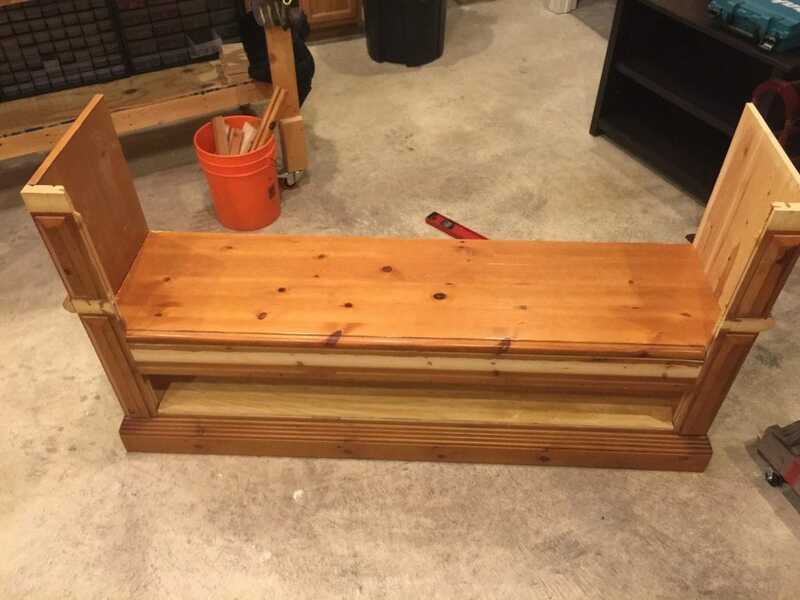 I removed the drawers from the dresser in order to spark my imagination, but I simply couldn’t get a clear picture of how I could possibly convert this dresser into a mudroom hutch. It was time for me to focus. First, I turned my phone off, cleared my mind, imagined I was looking at the dresser from the eyes of a child, and simply closed my eyes. Before you write me off as crazy and click away, allow me to briefly add some color to the comment above. For most of us as we grow older, our ability to use our imagination significantly decreases. Often times, we complicate things, worry about negative outcomes, and allow our logical minds to block our creative flow. Essentially, most of us find 100 reasons we can’t do something instead of finding 1 reason why we can. Essentially, my way of overcoming this creative stumbling block is to quiet my mind and pretend I am a child (~8 years old or so). As a result, the false limitations I impose on myself are lifted b/c anything is possible when I think like a child. Suddenly, the answer came to me, “Drop down the top of the dresser to form the seat!” This may seem like the obvious thing to do, but answers aren’t that clear when my imagination is blocked. 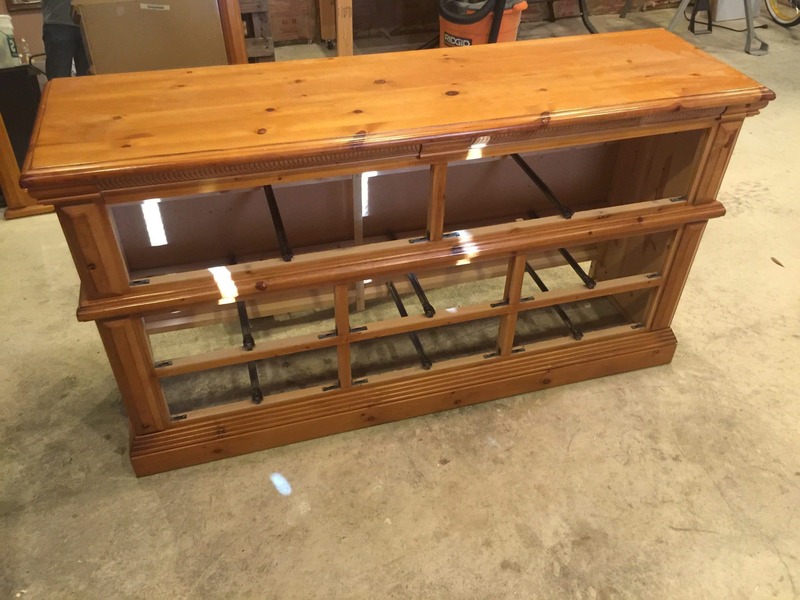 Ultimately, that spark was all I needed and I knew exactly how to transform old dresser into hutch. Next, I carefully removed the top of the dresser, the drawer sliding hardware, the moulding/trim, and the front frame that segmented the drawers. I was very careful with when I removed each piece in order to use them in a later step. Then, I placed the small pieces of wood in my bucket to keep them in one place. 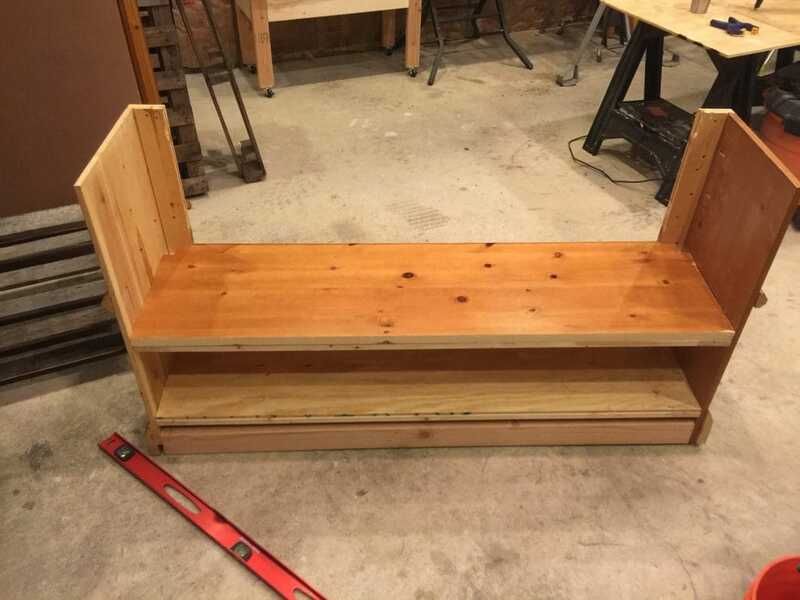 After I removed the top of the dresser, I cut the middle support board (between the large and small drawers of the dresser) and dropped it down about 6″ to form the shoe storage cubby. Finally, I secured the board to each side with pocket holes using my kreg jig. First, I built a 2×4 support square at the bottom of the dresser to secure the right/left wings & to add much needed stability. Also, I did not have any remaining 2x4s in my shop. So, I grabbed a few 1x4s I had laying around, cut them to size, and formed the base of the bench and the bottom cubby with pocket hole screws. Next, I secured the 1×4 braces to each wing of the bench with pocket holes as well. 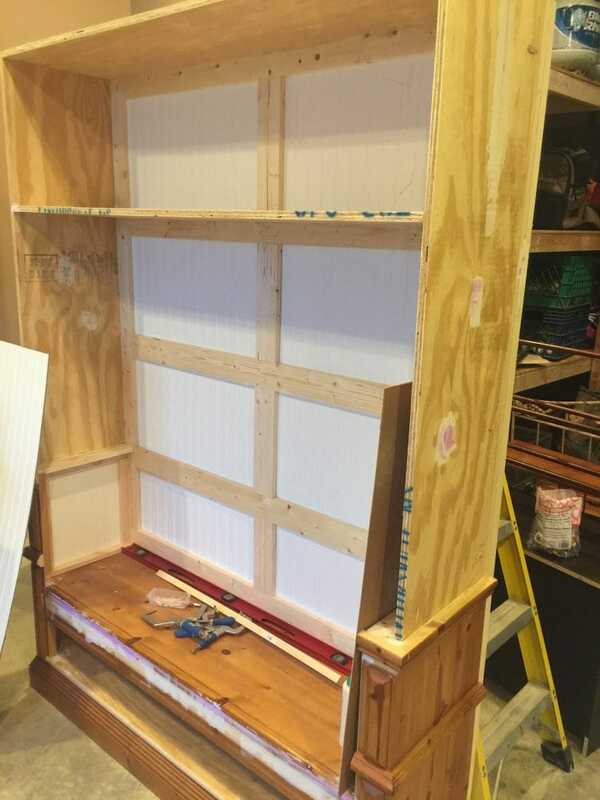 I used 1/2″ plywood as the base for the bottom cubby. Next, I ripped the plywood to a rough size with my circular saw and used my jig saw to cut around the front left/right indentations. 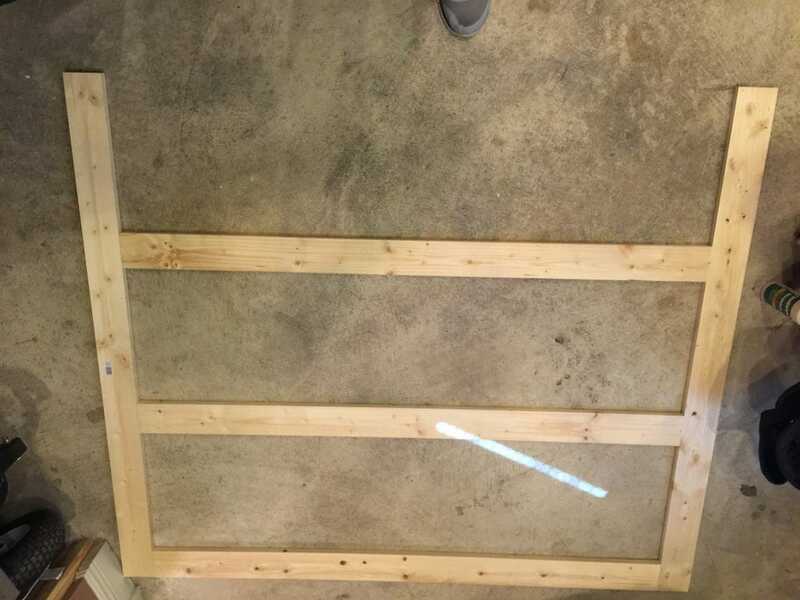 Then, I secured the plywood to the 2×4 frame with wood screws. First, it was time to cut what was the top of the dresser to size in order to form the bench. 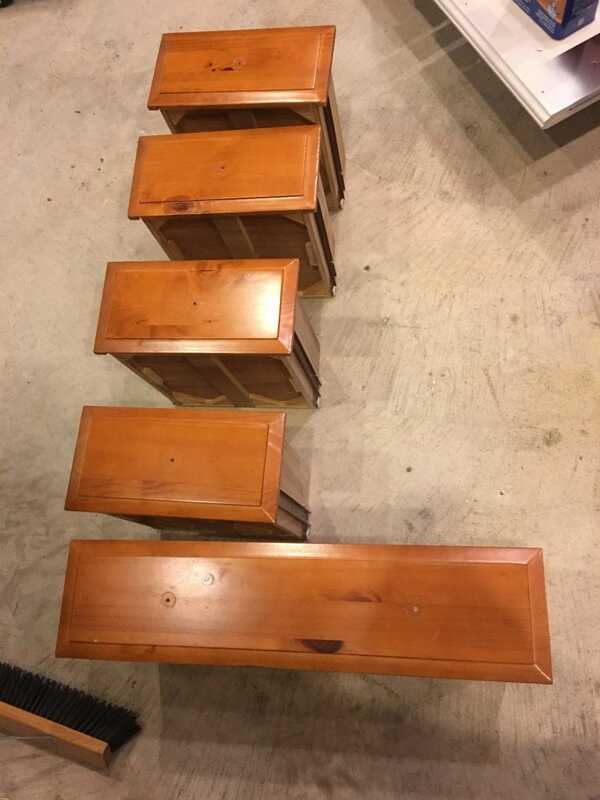 Ultimately, the top of the dresser will be the bench. So, I measured, measured again & measured again. Similar to the previous step, I used my circular saw to rip the 2 sides to size and my jig saw to cut around the front left/right indentations. The bench had a very snug fit, but I still elected to secure the bench from the outside of each side. 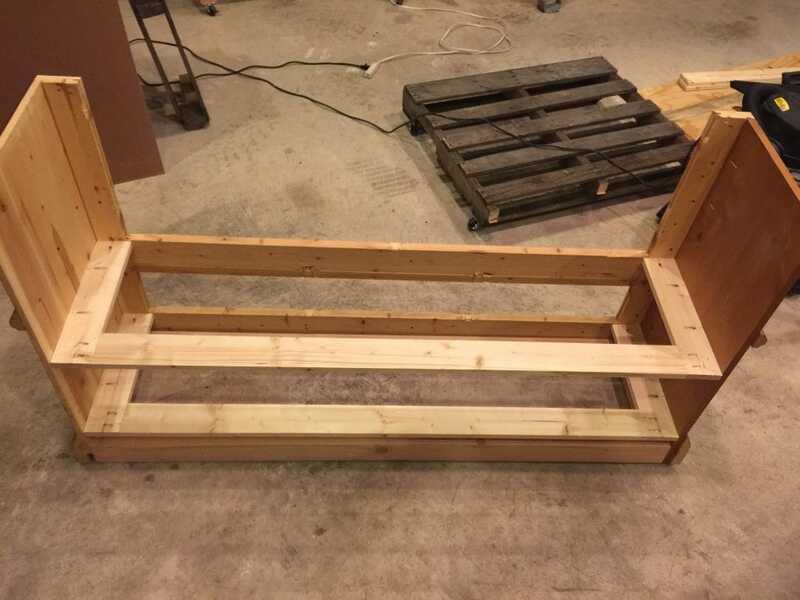 Furthermore, the 1×4’s supporting the bench were very stable, but they are onl 1x4s so securing the bench from each side with screws and from the top with brad nails was a necessity. I had to figure out a way to square things up a bit on the backside of the bench in order to mount the hutch. So, I cut a 1×4 to size to go across the back of the bench and used 1x4s to form a square on each side of the bench. Then, I secured a 1×4 on the top, bottom, and back of each side. I secured the 1×4’s with pocket holes. 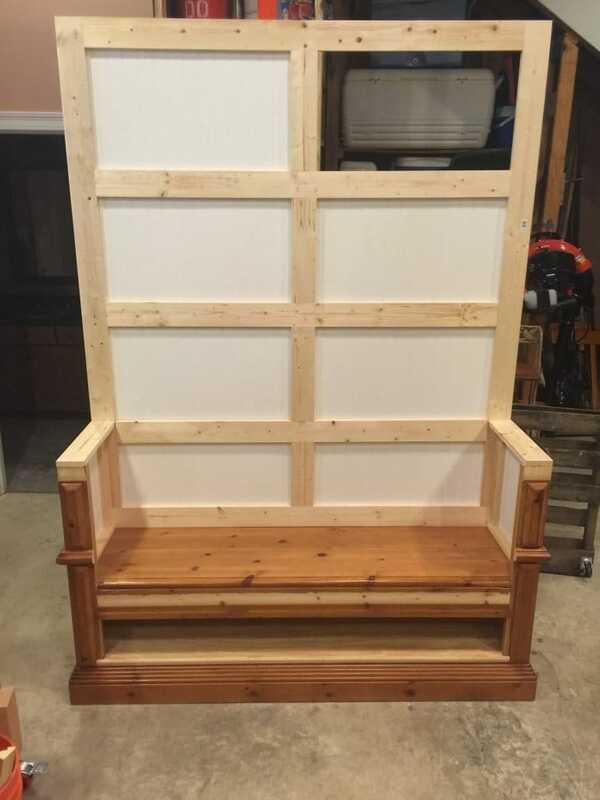 Next, I cut a square piece of wainscoting and secured it with brad nails and wood glue on the inside of each square on the right & left side of the bench. 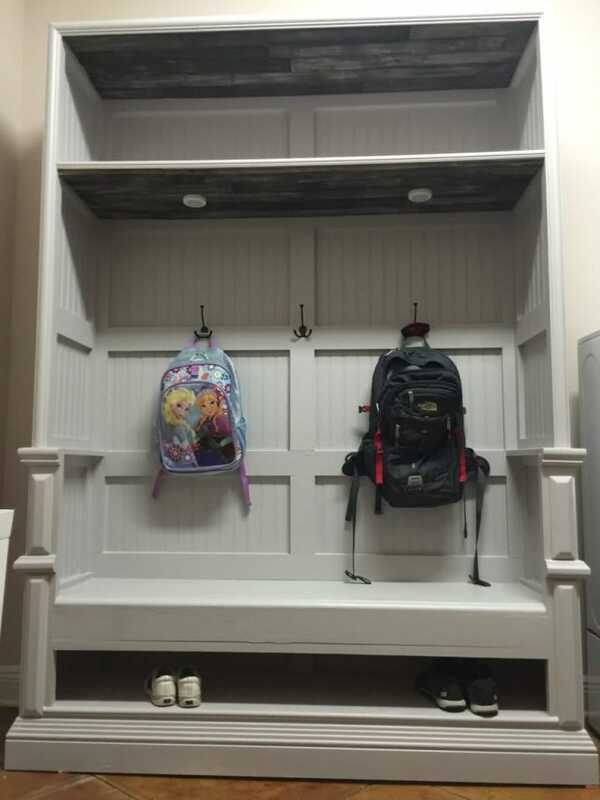 The wainscoting covered the bare wood on the right/left sides of the bench. I trimmed out the wainscoting with quarter rounds. 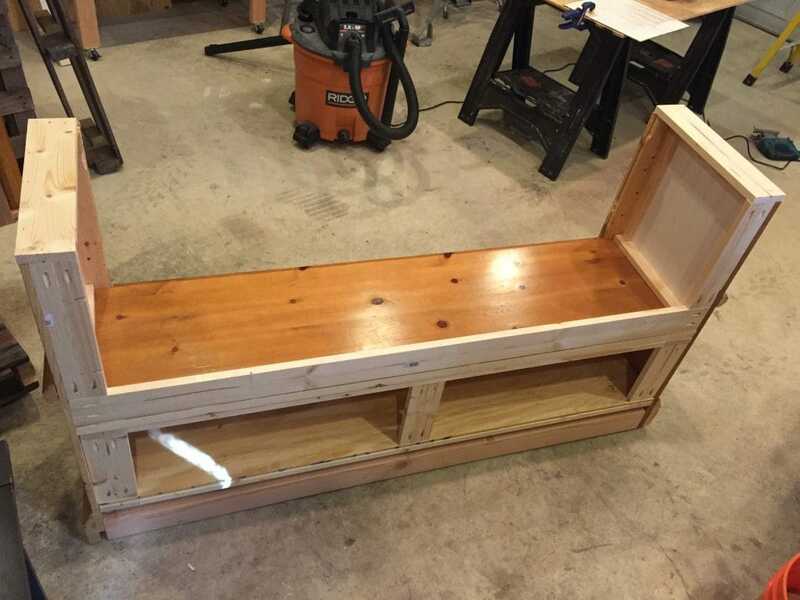 I decided to add a 1×4 to the top back of the bench to serve as an even transition to the hutch and provide more stability. 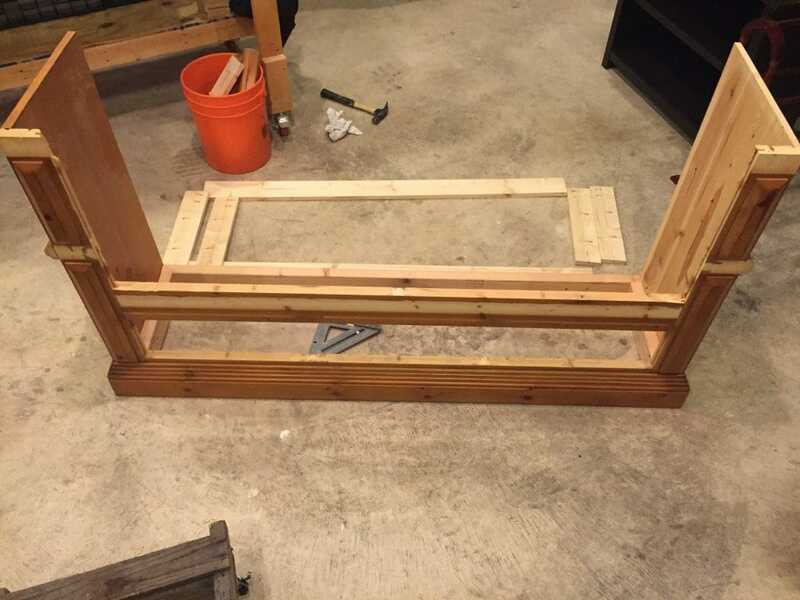 First, I created the hutch frame out of 1x4s and secured them with pocket holes. 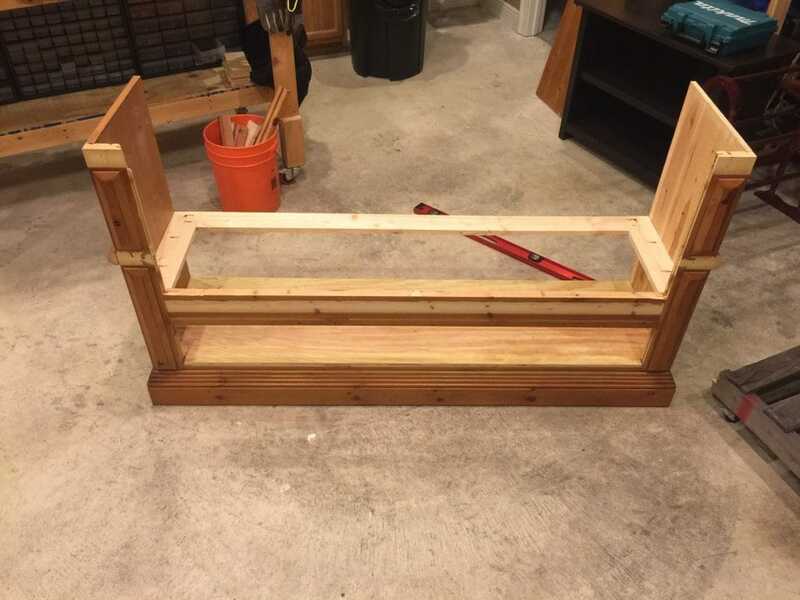 Next, I used 2x4s to further secure the frame to the bench and are recessed about an inch so they cannot me seen. 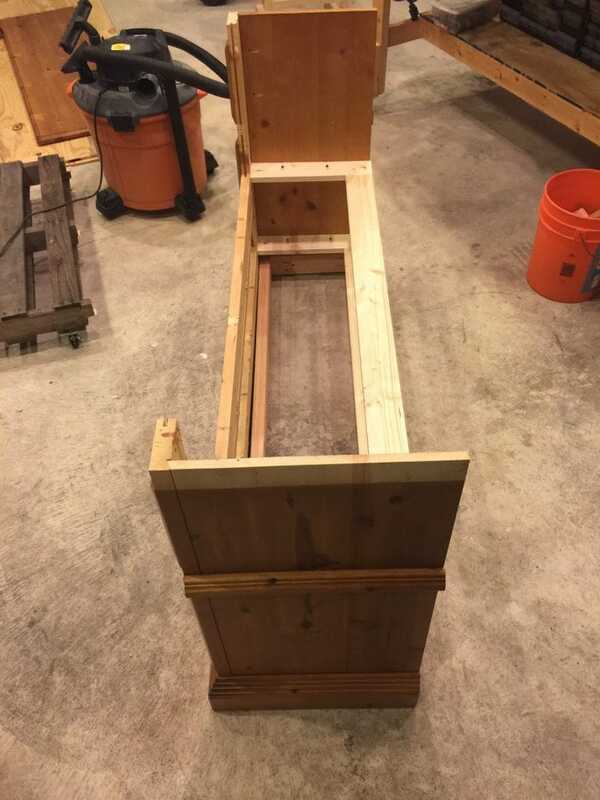 The 2x4s run from the bottom of the bench to the top of the hutch, across the top, down the other side to the bottom of the bench, and in the middle from the bottom of the bench to the top. Ultimately, the 2×4 frame in the back mirrors the 1×4 frame in the front. 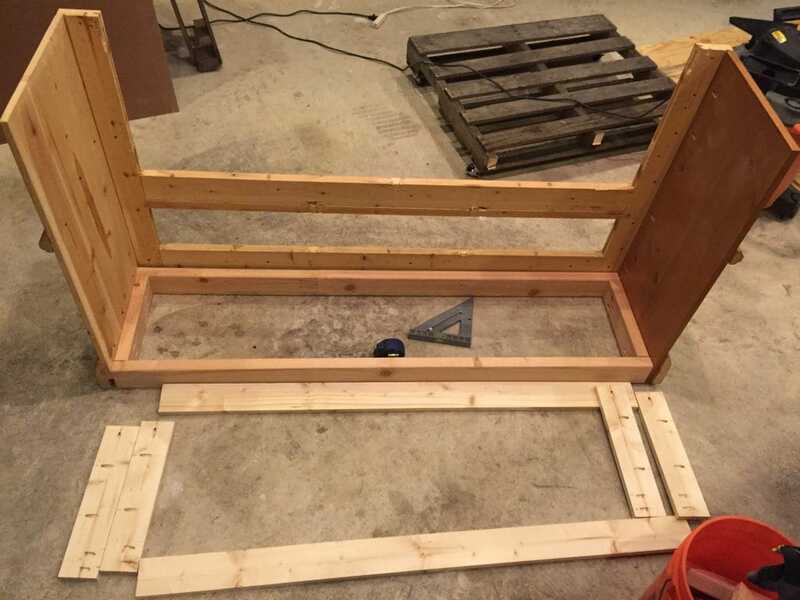 Additionally, I didn’t use only 2x4s to form the hutch frame b/c it simply didn’t look right. The 1x4s matched the original wood size of the dresser. First, I cut the wainscoting into squares and lined up each piece to the adjacent piece. Additionally, I chose to do this mainly to cut down on the weight of the hutch. I did not want this piece to get top heavy. 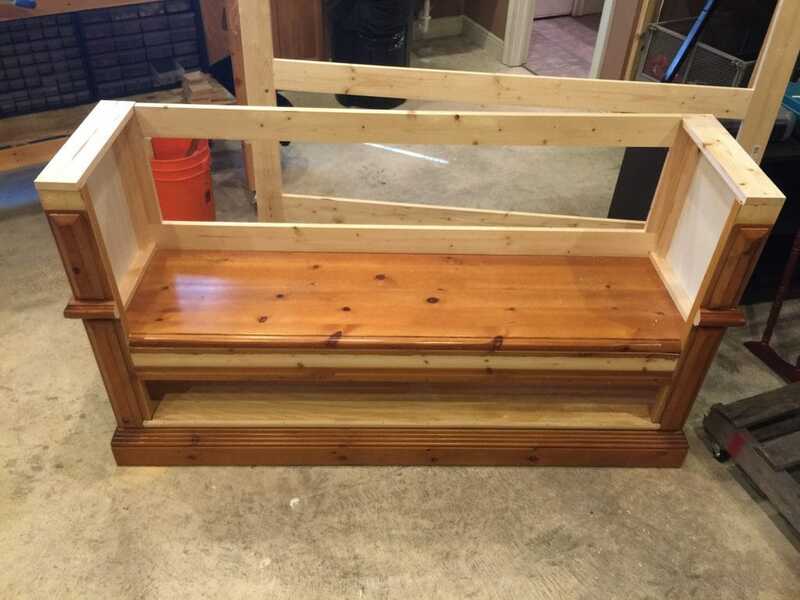 The size of the bottom 2 squares above the bench are not the same size as the squares on the hutch frame. Ultimately, I did this on purpose. The smaller squares did not look right on the top hutch. As a result, I hoped it would blend nicely once I installed the hardware. 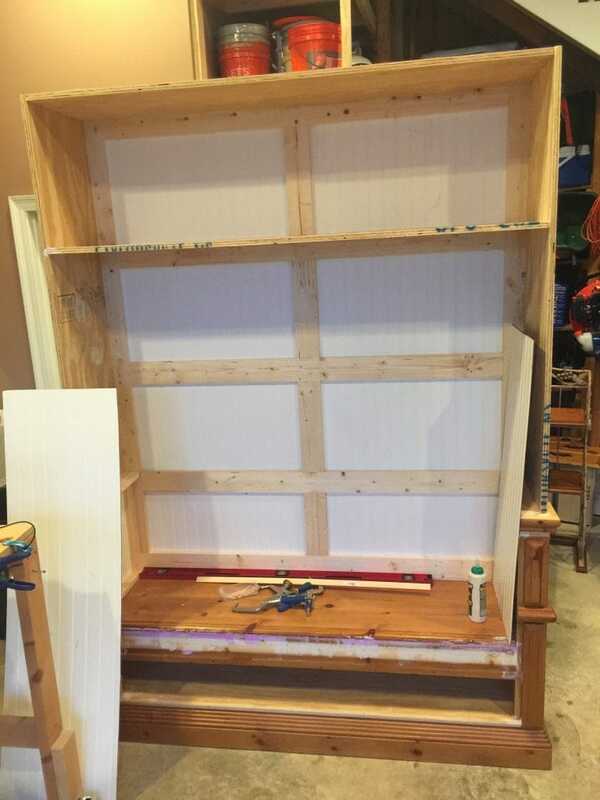 First, I added 1/2″ plywood on the sides, top and upper middle to sort of enclose the hutch. I didn’t like the ‘open’ look of the hutch without these extra pieces. Plus, it was the only way to build an upper compartment. Next, I secured the plywood to the 2x4s on the back of the hutch. The plywood actually wraps around the 1×4 frame on the sides and on top. Also, it’s hard to notice from the pictures, but I used a lot of the original trim from the original dresser. More specifically, on the front of each arm at the top. Additionally, I used the old trim on the outside of each side. First, I added wood filler to patch the holes in various spots. Next, I let it dry for a few hours and then used my orbital sander to sand it down. Also, I did the same on other parts of the bench. Then, I trimmed out the inside of the enclosed plywood frame with wainscoting, 1x4s, & 1x2s. Finally, I added a piece of trim moulding along the edge of the plywood frame and the front of the upper shelf in order to hide the edge of the plywood. First, I primed the piece with my Graco Truecoat Plus II paint sprayer & used zinnser primer. Essentially, I used a roller on the first coat of primer and used the paint sprayer on the second coat. The original dresser had a thick coat of polyurethane, which is not an ideal surface for paint to adhere to. 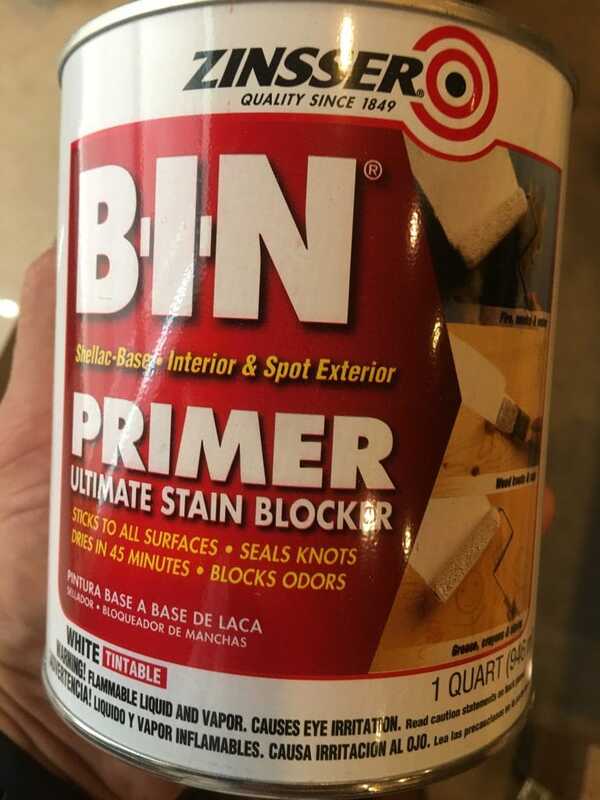 Ultimately, this primer worked really well. Next, I applied 2 coats of Sherwin Williams Essential Gray paint (Satin finish) with my paint sprayer. Furthermore, this paint sprayer saves so much time! I painted this entire piece in 5 minutes (for one coat). I used wood from the pallet I pointed out earlier in my blog. 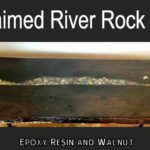 First, I put a dark stain (Dark Walnut – Minwax) on the wood and wiped each piece with a soft rag. Then, I applied white chalk paint very lightly with a chip brush. 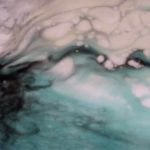 I didn’t paint the surface; rather, I used a dusting motion and wiped (smeared) the paint across the surface to distress it a bit. 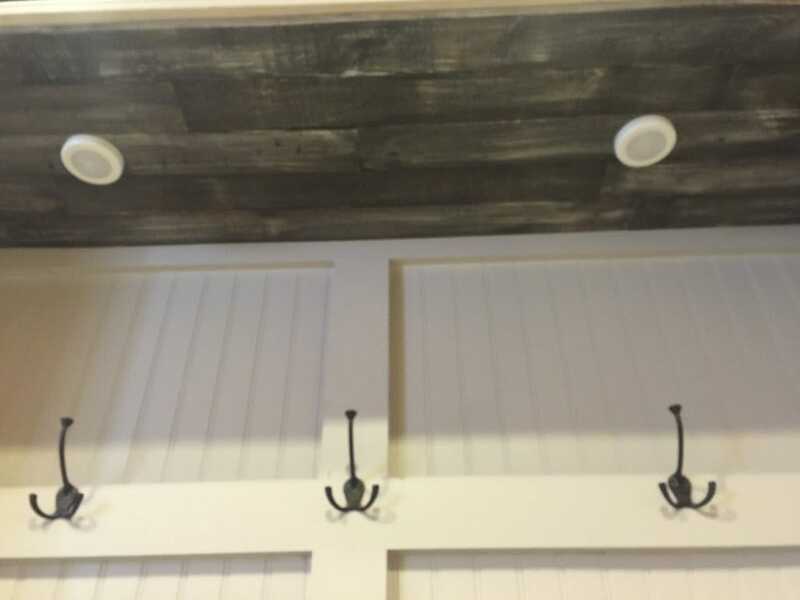 Next, I cut the pallet wood into various sizes with my miter saw and nailed them to both ceilings in the hutch. Finally, I patched a few spots on the front of the bench that were uneven and touched it up with a paint brush after it dried. I found these battery-operated, motion lights on amazon. Furthermore, I thought this would be useful for the kids if they were searching for a book in their schoolbag. Plus, it looks cool. Next, I secured the coat racks with my drill and screws to the hutch frame. 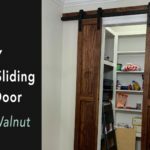 Obviously, this mudroom hutch was awkward to get into the house. It wasn’t necessarily heavy, just bulky and hard to deal with. So, I called my buddy Carlos who lives a few miles away to help me load it in the house. Thanks, Carlos! Needless to say, I’m happy with the final product. In addition, I am also happy b/c I know we will use this piece of furniture. Remember the drawers I removed from the original dresser at the beginning of the project? My wife recommended to repurpose dresser drawers into decorative storage cubbies with legs. In total, we had a total of 8 drawers and 2 of them were larger than the others. 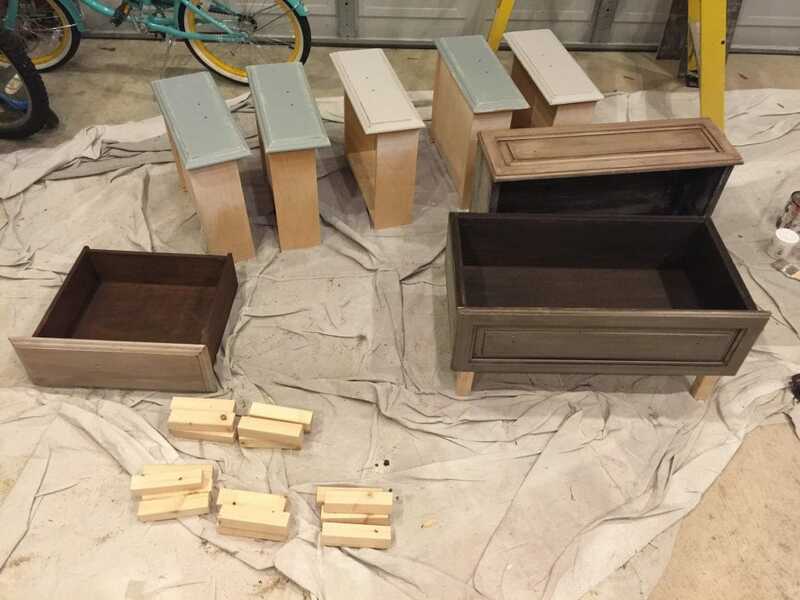 First, I removed the hardware from the drawers and sanded each of them with my orbital sander on all sides with 120 grit sandpaper and then 220 grit sandpaper. 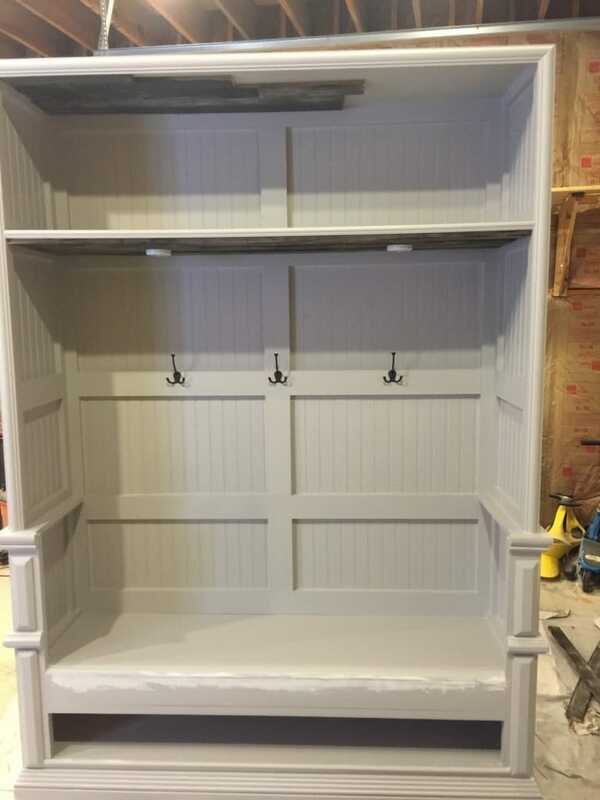 Next, I painted the face of the drawers with leftover latex paint (Satin finish) in my shop. Then, I let the paint dry for about 24 hours and then used 220 grit sandpaper to sand the edges of the face I painted. In addition, I sanded these by hand in order to control how much paint I removed. Ultimately, the goal of doing this is to expose a small amount of the wood on the corners/edges so that the stain can penetrate those spots. Essentially, this adds to the distressed look. First, I cut 4 2x2s to 6″ with my miter saw for the legs and sanded them with 220 grit sandpaper. Next, I applied wiped Dark Walnut stain on one piece at a time with a staining pad and wiped the excess with a rag. The stain darkens the paint color a small amount as you can see from the picture below. Then, I attached the legs to the drawers using brad nails and wood glue. My wife bought some antique knobs to put on the front of the drawers. 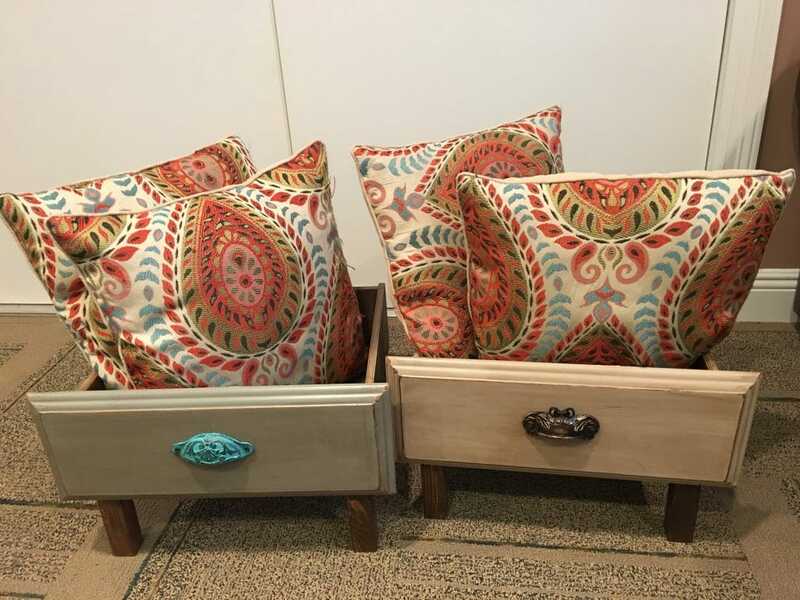 Obviously, these drawers add a bit of charm to a bedroom or living room. Also, they can be used to hold pillows, magazines, or just about anything. Every part of this dresser was repurposed into something useful! In conclusion, I hope you learned how to transform old dresser to hutch. 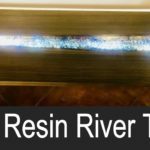 Be sure to visit my top DIY tool gift ideas. 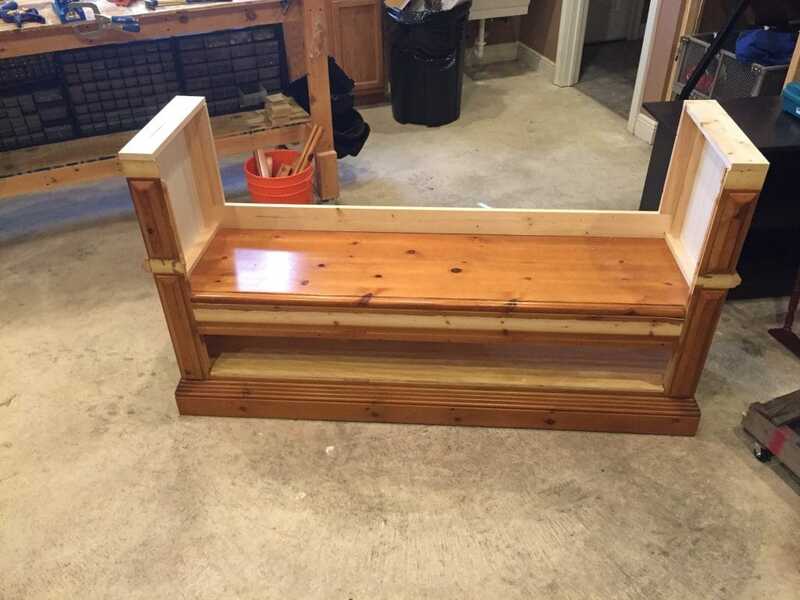 and my repurposed baby bed to bench project. Also, click the button below and download the DIY plans for this project. 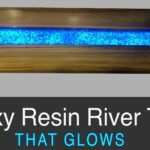 FREE DIY Plans for this Project! YES! Send The FREE Plans!